The definition of long-term is very subjective for day traders & buy-and-hold investors. Here, we will discuss the pros and cons of long-term trading from a buy-and-hold investors point of view. The definition of long-term is a subjective topic. This is because the term means one thing for day traders and another for buy-and-hold investors. 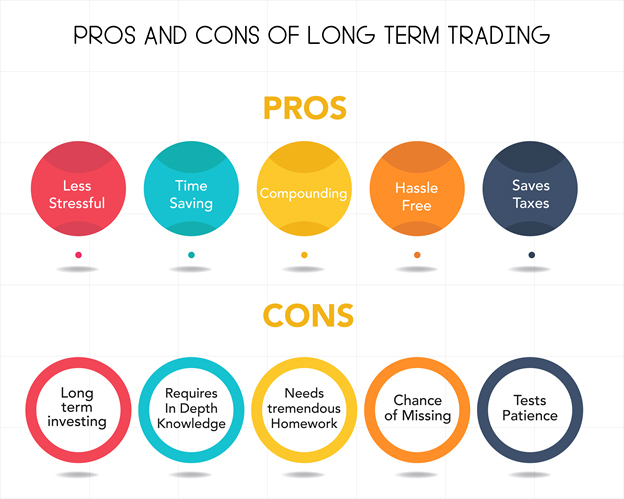 Here, we will discuss the pros and cons of long-term trading from a buy-and-hold investors point of view, which could easily mean holding the security for over 20 years. Less stressful: There is no need to follow the stock market on a continuous basis. You can ignore current market conditions and focus your attention on future market conditions. The time span is longer and you do not need to babysit your stock inventory, unlike in short-term trading. Time-saving: You can dedicate the time saved from consistently following the market to other productive activities. You can study the financials of a company and gain in-depth knowledge about it. A thorough research can turn an investment into a gold mine over the long-term. Keeps trading-related emotions at bay: Long-term trading helps rid you of emotions related to day trading. This keeps your perspective clear at all times and helps you to look at the growth outlook of the company and the viability of its business model from multiple viewpoints. Compounding: Long-term trading lets you take advantage of the power of compounding. Compounding is a system where your investment grows through interest earned on both the principal amount and accrued interest over a period of time. Moreover, long-term trading in stocks also gets you dividends which can be reinvested to earn more profits. Hassle-free: There won't be a need to learn various trading strategies or platforms since you will not be an ‘active trader.’ You can trade as a hobby, which can let you have a routine occupation as well. Save taxes: Long-term trading helps you save on taxes. Most short-term traders pay around 20%-30% tax on capital gains, while long-term capital gains are charged a tax of only 5%-15%. Investment: Long-term trading, as the name suggests, requires you to invest your capital over a period of time. You might feel that a certain amount of capital is blocked out in one stock which could, otherwise, have been used for short-term advantages. In-depth knowledge: Long-term trading requires you to have a deep knowledge of the sector you are investing in. You cannot just make decisions based on certain news, tips, or hearsay. Homework: You need to do thorough homework before going for long-term trading. Only relying on graphs or charts to make a buy or sell decision will not be enough. Chance of missing out: When one indulges in long-term trading, they are open to chances of missing out on capitalizing on market volatilities. Patience: Long-term trading requires a lot of patience. Failure to remain calm and patient will create problems for the trader in the long run and he will not be any better off even after waiting for so long.